First things first: I’ve gotten my kittenish figure back — or nearly. That’s no small feat, since I gave birth to 11 kittens just six weeks ago. I’ve taken a lot of ribbing since my story appeared in the New Fillmore and some people began comparing me to Octomom. Honestly, I have no desire to star in a reality TV show. But nearly everyone has been kind and supportive, confirming my belief that I’m lucky to live in such a great neighborhood. Dawn also brought over a kitty condo to house me and mine when the blessed moment arrived. Between you and me, I just assumed the condo would be outfitted with a trash compactor and a bidet and such. In reality, it looks more like a cage. But it’s spacious, and it felt like a safe haven to me. So I had those new babies there, in a room of our own filled with baskets of yarn and a gaggle of stuffed sock monkeys. 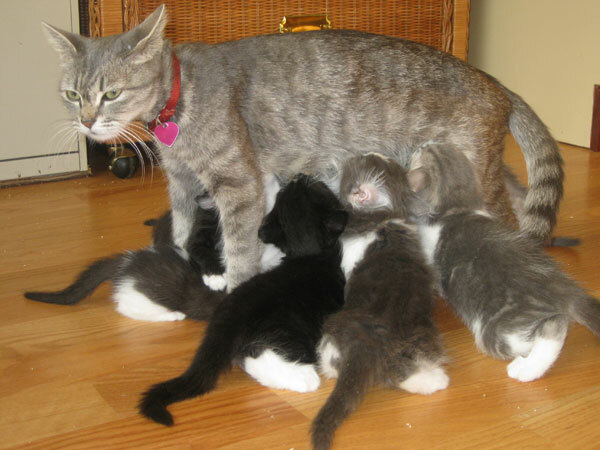 Once my kids were born, you could hardly swing a cat around here without running into someone who wanted to help socialize the kittens. As nearly as I can figure, that means the humans sit around the condo on pillows, cooing and oohing and ahhing and playing with the kittens. Often wine and cheese and olives are involved. And while none of the socializers share their snacks with me, their kitty cocktail hours allow me a break from my motherly duties. You may remember that the friends I live with rescued me, about to give birth, from an uncertain fate at Animal Care and Control. Since two of my kids from a previous litter already lived with them — and seem to rule the joint, although far be it from me to meddle — they feared those two wouldn’t take kindly to their mother moving in. So they tried to get me a temporary home at Pets Unlimited, that fancy veterinary center over on Fillmore Street that always has those pictures of fetching cats in the window, many with signs saying they’ve already been adopted. But a worker there said they don’t take in local cats, welcoming only animals from other shelters that euthanize — what an awful word — and I guess I can’t begrudge them that. Now that my brood has blossomed and they’re all practically teenagers and ready for new homes, the folks at Pets Unlimited said there might be a possibility that my kids and I could come in if we all surrender. But I don’t like the militaristic sound of that. As my past proves, I’m more a lover than a fighter. None of my newest kittens has left the basket yet to go off to their new families, but a number of people — all connected to the neighborhood — have put dibs on some of them. One local fashionista says she wants two. But they both need to be black so their shedding won’t show on her wardrobe — which is all black, of course. A handsome man from Florio and his handsome partner have been by to socialize three times now. They might take two of the little boys. They seem to have their eyes on Jack, the littlest in the litter — and possibly the handsomest, too. A teen who’s an aspiring journalist has her sights set on the kitten with a mustache who has an uncanny resemblance to Walter Cronkite. For her, it was modern love at first sight. Her mom was over socializing my kids one night. She snapped a picture of Walter and sent it on her cellphone to her daughter — who’s now got little Walter as the first thing you see on her cellphone. A gentle soul from International Orange, the yoga studio on Fillmore, had hoped to take in one of my kids so pretty they call her the Princess — but the landlord nixed the notion, as if she were a dog or something. So it looks as if a few of my kids are on their way to new homes with really nice people from the neighborhood. Saralee’s kids are now practically teenagers.